PHOENIX—Officers wielding pistols and ballistic shields kicked in the door of a suburban Phoenix home in the middle of the night to bring a sick 2-year-old boy to a hospital after his mother refused a doctor’s advice to get him to an emergency room for what was thought to be a potentially life-threatening illness. The doctor called child-welfare authorities on Feb. 25 after the mother didn’t show up at the agreed-upon emergency room, leading police in Chandler to knock on their family’s door to check on the condition of the boy, who earlier in the day had a fever of 105 degrees (41 Celsius) and was suspected to have meningitis. The parents, who said the boy was improving after his fever broke, refused repeated requests by officers to open the door, so authorities got a court order allowing them to take temporary custody of the boy. Once inside, authorities discovered that the boy’s 4- and 6-year-old siblings also had been vomiting, so another order was obtained to take the older children into temporary custody. A month after the encounter, parents Sarah Beck and Brooks Bryce still don’t have their children back. Police have recommended to prosecutors that they file child abuse charges against the parents, who weren’t arrested as a result of the incident. Nicholas Boca, an attorney representing the boy’s mother, declined to comment on why the three children haven’t been reunited with their parents, citing laws that prevent him from providing information that specifically identifies the parties in the case. The parents say their child was not in danger and police had no right to come into their home. Bryce declined a request by The Associated Press to comment, and his attorney, Tim Nelson, didn’t return a phone call seeking comment on his client’s behalf. While police said the forced entry was justified to tend to a child with a possible dangerous illness, critics say the door-breaking was more fitting for drug dealers, not parents who made a medical decision for their child. An attorney representing the mother said the boy, as it turns out, ended up having a respiratory infection, not meningitis. A police report said the mother brought the boy to a medical office in Tempe where a doctor told her to get further treatment at a hospital. Though the mother initially refused to do so out of fear of the repercussions of not having the child vaccinated, she eventually agreed to take him to an emergency room. The doctor, who had learned that the mother had ignored the medical advice, then called child-welfare authorities, according to the police report. Once officers were inside the family’s home, they found a shotgun, unsecured, in the parents’ bedroom. Authorities contend that the 2-year-old boy needed immediate medical attention for a high fever. His parents insist that he had been feeling better before he was taken away in a late-night raid. Chandler police declined to comment on the encounter with the couple, but a statement released several weeks ago said that officers were acting under a law that lets a court order the temporary removal of children who are believed to be suffering from abuse or neglect. State law also lets police officers use reasonable force to enter a building where such children are believed to be located. Court documents from the case, like other removal proceedings in Arizona, aren’t available because they aren’t considered to be public record. 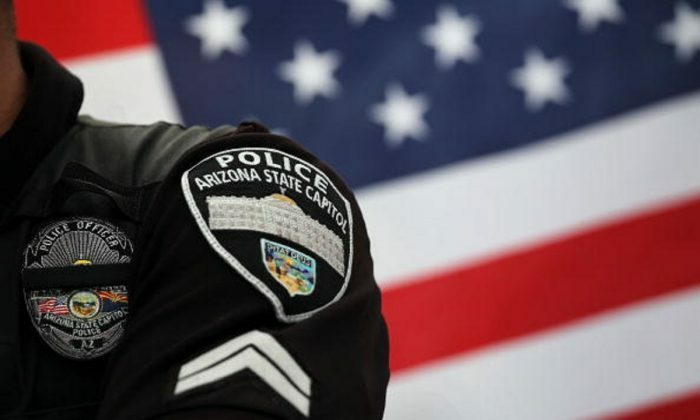 The Arizona Department of Child Safety declined to provide any specifics on the case, such as whether it was proper for an officer to kick in the door. Boca said the forced entry was traumatic to the family. “That type of force is reserved for violent criminals, not a house full of young sleeping children,” Boca said.